Token system released is broken. Waaaaaay too many gems to get the “bonus” unlocks on global tourneys with no way to earn gems at more that 4-5 every here and there. The ridiculous brawl stars game mode they released, even if temporary, has no place in this app with the one tower having even 1 turret. It’s a promotion for the game they released geared more toward younger players and to cash in on a Battle Royale style game money. On the upside, gold finally feels somewhat attainable if you don’t spend real currency and the normal game modes feel balanced for the most part, except golem/night witch/lightning. It really bothers me that I can play the normal modes and enjoy the game win or loss, but the second I have to participate in the extra games or tourneys, I want to throw my phone due to stupid decisions on game types or rules they put in. (Also, for those who say, “just don’t play those game modes” that is where a bulk of rewards I mentioned as positives earlier come from almost exclusively). I say this as someone who’s favorite game type is a draft battle, where all cards are random chance. Also, why they haven’t made draft or 2x draft a mainstay outside of the clan wars irritates me as well. All in all, I was loving every aspect of the game until the most recent update where I feel that Supercell took a huge step backward. It’s not enough to keep me from playing at this time, but it is definitely pushing me in that direction. Supercell, great game, no doubt. Award winning. But you axed clan chest, where accounts and clans would be rewarded for higher volume of play, to a point, and replaced it with a war that takes 48 hours and lets me play 4 rounds to contribute. So instead of playing 30-70 rounds this weekend, I’ll play 15-20. You ruined an activity and feedback loops for clans to understand who was playing a lot, and also made it so there is almost no way to step out individually. I bet you did a crazy amount of concept design and research on this, and you guys are experts at social gaming, so there have to be 10-15 good ideas to reward those who want to play more. Break those out. I’m okay with the card limitations in war decks, it forces investment and creativity in ways I haven’t thought of before, so it’s a good frustration. Also, frequently, we have multiple clan members cheering during a match, that is a good add, and funny with all the confetti. Integrate more of that. Maybe in addition to the one individual war match, there can be pools of match variations that a clan can draw them to increase clan glory, work on better rewards, and generate higher participation. Lots of thoughts, let’s take this war idea and kick it into action. Our clan only has bored things to say after the initial concept wore off in 4 battles. I’ve been playing this game for a couple of years and I’ve always enjoyed it. However even though they have improved much about it, it still has some key issues that hinders the game from being even more enjoyable. The main thing that has always bothered me is getting matched up again players that are higher level; even though they may be in the same arena, playing against players at a higher level automatically puts you at a disadvantage. Facing an opponent that is only one lever high is not too bad but countless times I’ve went against people who were 2 or 3 levels higher than me. 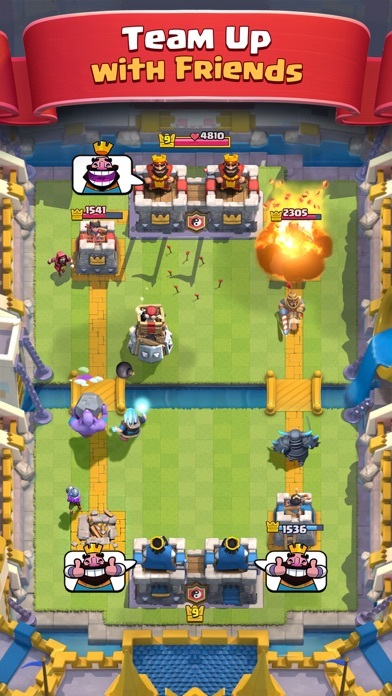 So they have a higher hp for their towers and usually higher level cards, so that has always bothered me since that affects the outcome to many battles. The second thing that bothers me is in 2v2 battles when your teammate leaves halfway, you’re guaranteed to lose. There is no way you could win against 2 players. I know there’s practically no way to prevent people from leaving but if there was some type of penalty for rage quitting and leaving a teammate stranded I feel that would be appropriate. That’s just one suggestion to improve that aspect. Overall there’s a reason why I’ve been playing for so long. It’s super fun but like I said there are things keeping it from being even better and possibly moving the game to the #1 strategy game in the AppStore. Prefer Clash of Clans legendary cards to hard to get! I have been a big fan of Supercell for a long time. I’ve been playing clash of clans for over 3.5 years as well as clash royal. With updates like the builder base to clash of clans it has honestly kept me more interested in playing COC over royal. My main lack of interest in keeping up with clash royal is that the legendary cards are more of a luck of the draw to receiving vs. something I feel I have more control of obtaining. I’ve played a while and have still never gotten cards I could have received at lower levels. I guess that alone keeps some of the interest down. I like that if I really want to get a certain character in clash of clans there is a very clear process that I can work to get that character and improve them. With Royal I can request cards from people in my clan to upgrade faster but I still may not get a cards I haven’t received yet and have no way to change that. I do like games that are a little unpredictable and use chance but it’s frustrating that on my end I can’t do anything to get certain cards I’ve always wanted. I guess that had kept me from being an active player regularly with royal as compared to clash of clans that I probably have plaid almost daily for 3.5 years and have been really happy with the updates that have come out, it’s without a doubt my favorite phone game! Overall, it’s a super fun game. It’s definitely not pay to win unless you want to try-hard, but there are some issues. The implementation of quests was definitely a bonus, but Supercell started reducing the number of challenges. I remember when triple and double elixir came out, there would be an elixir challenge with 100,000 gold reward every month. We need more opportunities to gain resources, especially when you get into the higher arenas. 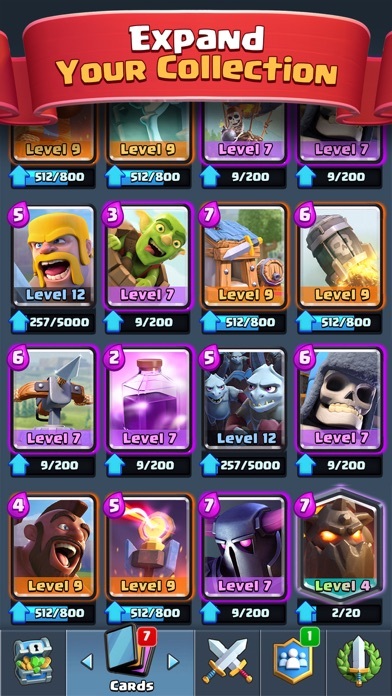 I’m level 12 and I still don’t have a maxed card, but I’ll play a level 11 with maxed commons and rares (partially my fault for upgrading random cards). The game slows down significantly when you can’t change your deck because you only have a few cards upgraded. Also, PLEAAAAASE change the donations for rares from 4 to 8. 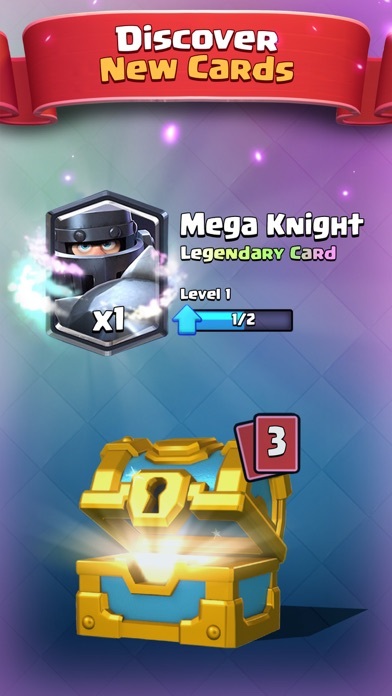 The donation process is so slow; it would take about 3 months to upgrade a level 9 rare, and the game never gives you the card you need through chests. That’s another thing: adding a “preferred card” system where you can choose a few cards that you would prefer. This would be a huge help and really make the game more flexible at the higher tiers. 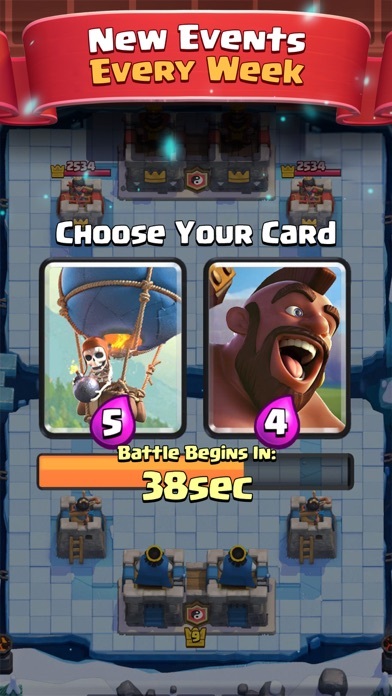 Supercell, one more thing: stop adding new cards; no one is asking for them and they are pretty useless. Just take your time to put in effort to make decent cards. The problem with this game is that it takes too long to complete the unending objective of getting trophies. You get cards to win games by opening chests which you get by tapping on your phone for 20 minutes. Then those chests take 3 hours or more to open, and when they finally do, you tap on the screen 5 times and then its over. That was your 20 awesome minutes/hours of waiting playing this game. You tapped to deploy things for 20 minutes, opened a crown chest, opened a regular chest, and now your done. The only realistic way to win trophies is to keep repeating this 20 minute process every day to eventually upgrade your cards which become more and more impossible to upgrade. So, the whole game is opening your tap fuel chests to get cards to get trophies to then... repeat the process all over again because to keep winning, you need more cards! This phenomenon is similar to what happens in Clash of Clans in that you need to keep repeating the unending, scaling difficulty process of upgrading things in order to get trophies and satisfaction. So by seeing that, what’s the point in playing if you will never have long term satisfaction? That is your question to answer when playing this game. Most of the short term satisfaction comes from the smooth buttons, animations, and sounds. In the end, then, this game is utterly tapping fuel. Clash Royale is an extremely fun game. i'm currently at about 3500 trophies and it's a little challenging to push higher, but it's definitely possible. The game mechanics are all great maybe there could be a little teeny bit more special challenges but right now I have no complaints. The game mechanics are all great maybe there could be a little teeny bit more special challenges but right now I have no complaints. 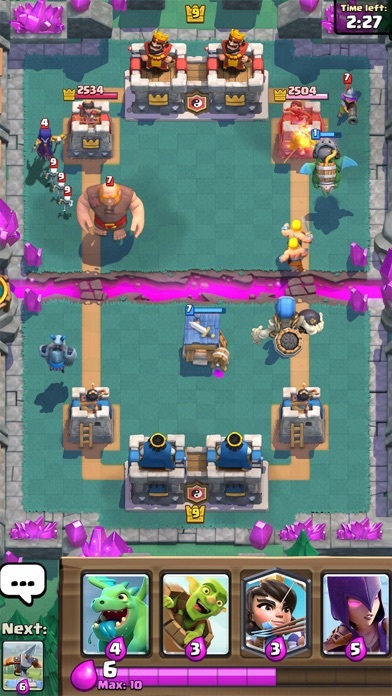 I think that you guys should really add 2v2 as a permanent feature or at least a permanent feature if you want to play with your friends like you should always be able 2v2 with your clan mates/friends. also I think it should be slightly easier to get legendaries or at least ones of your choice. to be honest 40,000 gold is a ton of gold so maybe you could lower it down to 30,000 or 25,000. I have gotten gift cards and that's the only time I spend money on this game and I've got probably four of my eight legendary's from paying so I think that if you really don't have enough money/just don't want to pay on a game usually get maybe a teeny bit easier to get legendary's like maybe legendary chest are 100 gems or 200 even 250. anyways great game just trying to voice out a little bit of my problems with this game I don't see me ever quitting this game so thanks for making this game. I have a ton of fond memories playing with my clan l, and I’ve been playing Royale since it launched. I managed to build a strong, fun loving, active clan where everyone helped each other. It was great. Then supercell decided to bring clan wars into the picture. They were exciting and frustrating but I gave them time. Well, it’s been several months now and my clan has managed to get to gold league level 3 from non-stop war. However, it’s really taken a toll. Engagement is down, most of the regulars have quit and now if I leave my clan open for new members to join, all I get are people who join wars and then abandon the clan. There’s no good option. If I make the clan “invite only” I can’t do enough recruitment on reddit and discord to get more than one new person a month, who usually quits after a couple of wars anyway. You might say that you can just play the game without wars, and you’d be right, but for me and my clan it was always about working together, and the old system of unlocking chests together was a blast. My guess is the developers must be making a lot more money from in app gem purchase with the war system, but in the end I think it’s going to slowly gut the game. If you’re looking for a way to waste a few minutes a day, look no further. But if you’re looking to have an engaging, fun filled social time with folks from all over the world, I suggest you spend your time and money elsewhere.